Creative Routes was established in the year 1999. It is a young company with a mature mind. Gabriel Rufus- an Asian American who started this company is a "go getter". His advertising agency background from India combined with a "can do" attitude enabled Creative Routes to offer the following services to clients: IDEAtising services: At Creative Routes we enjoy developing great ideas that are relevant to our clients marketing needs, problems or opportunities. We do logo designs, web designs; from concept to final production of corporate brochures, product literature, radio and television commercials. 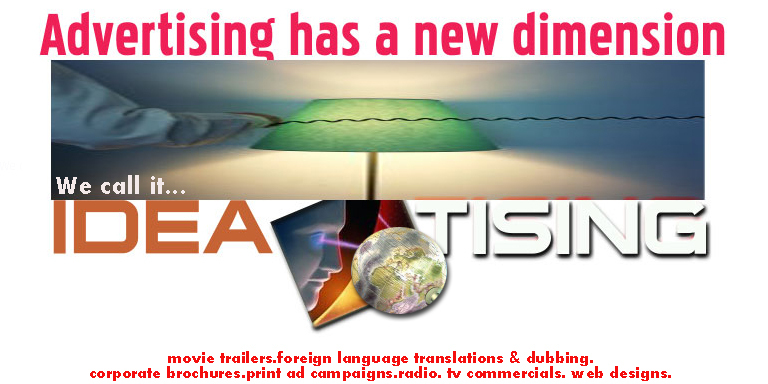 Foreign Languages for Media: Should you have a need for translations or dubbing of videos into other languages, you've come to the right place. We offer more than 40 languages and our pool of language translators, voice actors and ADR directors are available for small, medium or even mega projects.